What could be more inviting than sitting around a long table with friends and family under your Cedar lined patio with with fresh crusty bread and a big bowel of winter warmer pumpkin soup? Well, Castlegate Home Improvements can build the patio and deck for you and we will even share our winter warmer Vegetarian Pumpkin Soup with you. 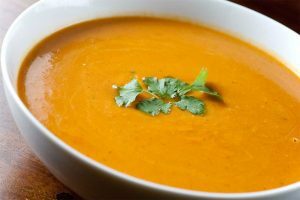 Enjoy your winter warmer pumpkin soup with a thick piece of rustic bread or for those who avoid bread, Emma in our office likes to dip gluten free crackers into her soup.